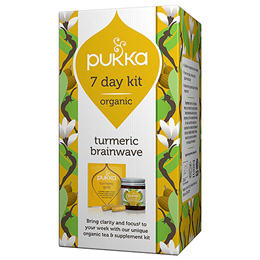 Bring clarity and focus to your week with Pukka`s unique organic tea & supplement kit. An inspiring 7-day organic tea and herbal supplements kit, created to bring a golden glow to your week. This is a tea to celebrate life - lemon fruit, aromatic cardamom and whole leaf green tea expertly blended with one of nature’s most powerful herbs. The elegance will leave you feeling renewed as each cup lets you don turmeric’s shield. A golden tea that will colour your life but not your teeth. Turmeric Brainwave helps the mind to break through the noise of modern life, restoring concentration and motivation. Whether you`re suffering from exam stress, work demands, poor memory or succumbing to age, Pukka`s incredible blend of herbs including Brahmi can help you meet challenges head on. Turmeric Gold Tea: 100% organically grown ingredients: turmeric root (40%), Pin Ho Wild Jade green tea (20%), licorice root, cardamom pod, lemon essential oil flavour (6%), lemon whole (6%), lemon verbena leaf. Turmeric Brainwave Food Supplement: Brahmi leaf *, gotu kola leaf *, turmeric root*, reishi full-spectrum*, rosemary leaf extract*, cardamom seed pods*, holy basil leaf wholistic extract*+, turmeric root wholistic extract*+, green tea leaf aqueous extract*, Seagreens® Arctic fresh seaweed*, vegetable cellulose capsule (hydroxypropyl methyl cellulose). 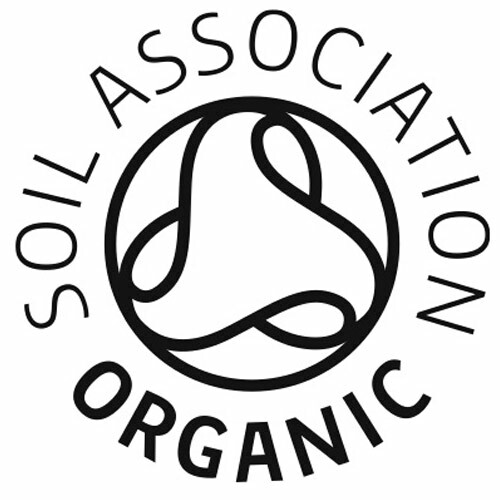 *organic, +contains non organic anti-caking agent - silicon dioxide. 2 capsules per day every morning with water before food / Infuse 1 tea sachet in freshly boiled water for up to 15 minutes once a day. Do not use this product as a substitute for a varied and balanced diet and a healthy lifestyle. Below are reviews of Pukka Organic Turmeric Brainwave 7 Day Kit by bodykind customers. If you have tried this product we'd love to hear what you think so please leave a review.